Shenzhen City will add 1500 pure electric K9 buses and e6 taxis to its public transportation fleet, already the largest zero-emissions fleet in serviceworld-wide. Commenting on these successes, Shenzhen Development and Reform Commission (SDRC) Director Xiangzhen Lu said, “Shenzhen is the first city in China to implement a subsidy for new energy vehicles and the first city to launch consumer sales of the BYD e6.” The zero-emissions Taxi fleet has already given many consumers their first experience with the BYD all-electric, 5-passenger e6, China’s first long-range, pure-electric car. SDRC cited rising oil prices and growing environmental pressures as key reasons to transform the public transportation system. Shenzhen City believes electrified transportation offers the most effective way to simultaneously stimulate economic recovery while restoring the environment by lowering CO2 emissions. 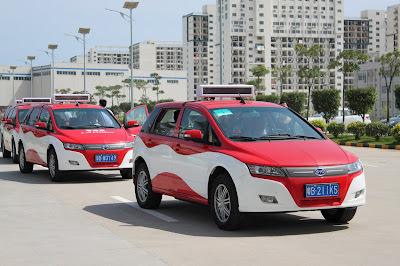 The addition to the fleets will include 1000 pure electric buses and 500 pure electric taxies, all manufactured by BYD.